ST. GEORGE — Legend Solar, one of the fastest-growing solar power providers in Utah, received national recognition this month from QuickBase, formerly a division of Intuit and one of the leading low-code app development platform companies, adding to Legend Solar’s growing list of accolades close to home and beyond. The company, which co-founders Shaun Alldredge and Shane Perkins started out of a car in St. George in 2012, was honored as “Small Business of the Year” during the 2016 QuickBase Customer Awards, presented at Empower 2016 in Nashville, Tennessee, earlier this month. Closer to home, Legend Solar was recently honored by Dixie State University in St. George as one of five “Businesses of the Year” named during its traditional Dixie Awards ceremony. In their category, the awards recognize businesses that have demonstrated extraordinary commitment to the school – a commitment that is indisputable in Legend Solar’s case in light of its recent $10 million donation to the university announced in April. 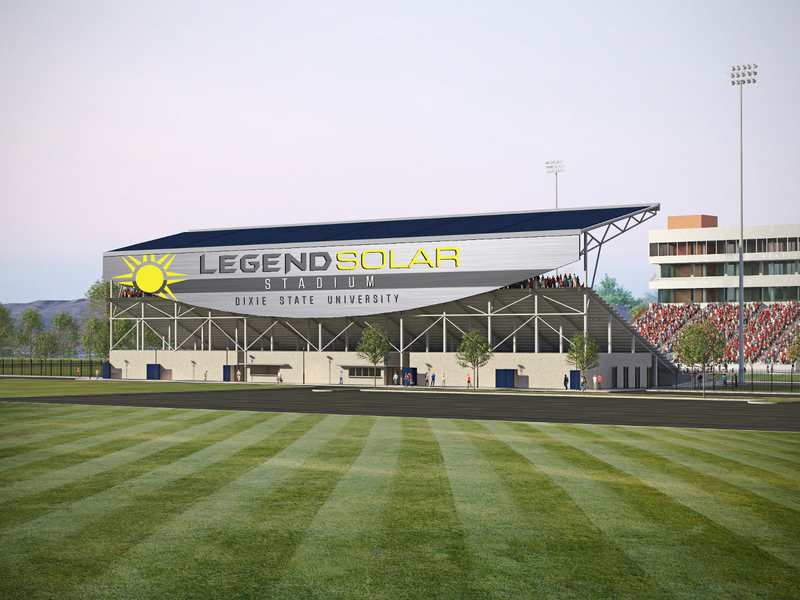 The donation, designated to fund the first phase of renovations to the school’s football stadium and installation of solar power on campus, was applauded by Dixie State President Richard Williams. He said it would single-handedly change the landscape of the campus and the City of St. George and create immeasurable opportunities for both the school and the region. St. George Mayor Jon Pike called the donation “huge” for the area, anticipating its fruits will demonstrate the university’s commitment to sports as well as academics, attracting more students specifically and people in general to the area. And there may be more coming for the entrepreneurial company. Earlier in April, the global professional services organization EY, comprised of member firms of Ernst & Young Global Limited, named Legend Solar’s co-founders among finalists representing 21 Utah companies in its “Entrepreneur of the Year” award for the Utah region. The winner will be determined by an independent panel of judges appraising the entrepreneurs and announced at a June 4 gala at The Grand America Hotel in Salt Lake City. According to its news release, Legend Solar has set the bar as Utah’s premier and fastest-growing provider of solar power for businesses and homes since 2012. The company launched in St. George and now provides services throughout Utah with expansion underway in Nevada and Oregon and planned in Arizona, Wyoming, Montana and Idaho. The company is an Elite Dealer for SunPower, which, according to Legend Solar’s news release, is one of the world’s most innovative and sustainable energy companies that manufactures the highest efficiency solar panels available today with the industry’s best 25-year combined product and power warranty. Legend Solar ensures that customers receive the best value for their installation by customizing the system to meet each family’s needs, according to its release. The company helps customers take advantage of appropriate tax credits and provides them with aggressive financing options, so homeowners can afford to get into solar power today. With the advantages of being a SunPower Elite Dealer, it said, lead time for installation is shorter than industry averages. I still think there is something awful fishy about the business. The growth levels and revenue streams they claim reminds me of the meteoric rise (and spectacular crash) of the dot-com era. It is simply unsustainable. Actually, voice of reason, you should do your research. Southern Utah is the perfect place for solar power. Yes, the panels are expensive. Yes it does take some time to pay off your investment. Typically If you were to spend “X” amount to power say your house it would probably take you up to 10 years to pay it off. However, the latest solar panels are expected to last up to 50 years. Can you imagine no power bill for 40 years?